Is “Cold But Competent” A Problem in Science Communication? In this featured guest post from the COMPASS blog*, author Liz Neeley (current Executive Director of The Story Collider) explores the perceived ‘cold’ reputations of scientists in comparison to other professionals. What is the quality we call ‘warmth’ and how important is it to the way people view scientists and to their level of trust in science? Keep reading to find out. A flash of insight can be profoundly pleasurable. For me it’s a little pop that’s the mental equivalent of clearing my ears while diving. Sharing that same electric sensation with hundreds of others in crowd? Then the pop feels more like a champagne bottle, with our individual ‘aha!’s spiraling outward as a fizzy wave of tweets. At the Sackler Colloquium on the Science of Science Communication, Susan Fiske of Princeton University uncorked one such shared moment in her presentation about beliefs and attitudes regarding science when she began speaking about warmth and competence. You can sometimes get a sense of the pulse of a meeting by watching the ebb and flow of its TweetStream. This graph shows the first day of the Sackler Colloquium. The biggest buzz was generated by Susan Fiske’s remarks, with some 900 tweets during her 90 minute session. Analysis using Topsy. You can read the tweets sharing and reacting to Fiske’s talk here. Within the first four minutes of her presentation dissecting when and how people make decisions, Fiske told the audience that scientists have the respect of the public but not their trust. Trustworthiness, she explained, is a quality produced by a combination of perceived warmth and competence. Warmth in this work is not exactly ‘likeable,’ rather, it refers to the judgments we make about person’s motives. Competence is their ability to act on those intentions. 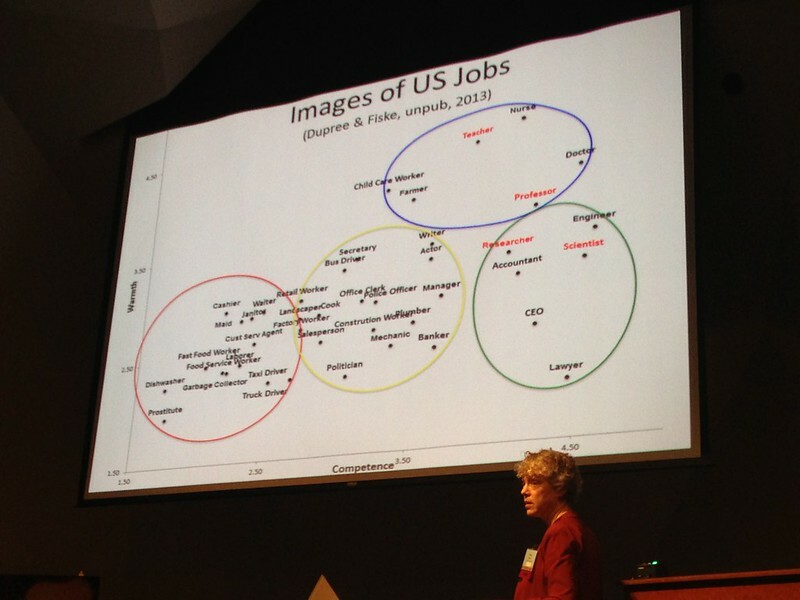 Scientists, Fiske says, are seen as competent but cold in comparison to other professions. What is this quality we call ‘warmth’ and why is it important? What do we know about how people view scientists in terms of warmth and competence? How can we – individually and collectively – counteract ‘cold’ reputations, if that is an important and valid goal? In short, Fiske et al. argue that we have “decades of experimental social psychology laboratories, election polls and cross-cultural comparisons” all telling us that our instinctive judgments of warmth explain most of how we assess strangers, happen in split seconds and are more important than our assessments of competence, and directly predict behavior. The data on how scientists are perceived is as-yet unpublished, though Fiske showed some of it at the Sackler Colloquium. Fiske presenting data from Cydney Dupree, showing warmth and competence assessments of different professions. Science-related careers (scientist, researcher, professor, teacher) indicated in red. Photo by Liz Neeley, Creative Commons license. Until we can take a hard look at the data, we should maintain healthy skepticism. But if it is true that scientists are seen as cold but competent, we may have a problem. My understanding is that this combination of traits can breed envy and jealousy, which psychologists link to “passive association and active harm.” When we talk about public trust or science as a brand, this is no minor issue. It’s also important to acknowledge too that this literation about stereotype formation can lead to uncomfortable insights and hard conversations about race, gender, class, and other dimensions. Most social groups are not in the admired ‘very warm and very capable’ category. We must think carefully, and question assumptions that people are responsible for negative perceptions about them and could control those judgments if only they behaved differently. This is dangerous territory. We all know what it feels like to be working to make a good impression. When I asked twenty or so friends and colleagues to contribute to this post by sharing what they think signals warmth, they talked about smiling, eye contact, posture and body language, authenticity, and above all, listening to other people. This aligns with related work on impression management, finding that “when people want to appear warm, they tend to agree, compliment, perform favors, and encourage others to talk. When people want to appear competent, they emphasize their accomplishments, exude confidence, and control the conversation.” That quote comes from a paper by Holoien and Fiske with the intuitive but fascinating finding that people downplay positive impressions in the warmth dimension in order to appear more competent. Another group went so far as to include “You want to appear competent? Be mean!“ in the title of their paper. This seems to particularly relate to hypercriticism. I can’t help but think of how this manifests, for example, in journal clubs and job talks. The bottom line for me is that if we are concerned about trust in science and perceptions of scientists, we must focus not only on competence but also – and perhaps more importantly – warmth. Rather than artificially exaggerating traits we think convey friendliness, scientists and science communicators should simply resist the tendency to emphasize their credibility at the cost of their personality. In short… perhaps the best advice is the simplest. Be yourself. *This article was originally published on October 21, 2013. It has been reposted with the permission of COMPASS Science Communication, Inc., a non-profit, non-advocacy organization whose vision is to see more scientists engage effectively in the public discourse about the environment.